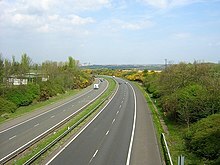 The A74(M) and M74 form a major motorway in the United Kingdom, mainly in Scotland, with a short section in England. Following an extension opened on 28 June 2011, they connect the M8 motorway west of Glasgow to the English border at Gretna, creating a route from the south to the west of the city. In conjunction with the M6 motorway, they form one of the three major cross-border routes between Scotland and England. [clarification needed] They are part of the unsigned international E-road network E05. Although the entire route is usually referred to as the M74, more than half of its length is officially the A74(M); see naming confusion below. 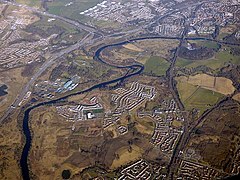 From its junction with the M8 just south of the Kingston Bridge, the newest section passes through the Glasgow districts of Govanhill, Polmadie, Oatlands and parts of the nearby towns of Rutherglen and Cambuslang on an elevated embankment, with junctions at Kingston, Polmadie Road, Cambuslang and Tollcross before connecting to the pre-existing M74. 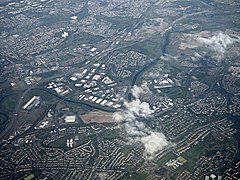 It then runs in a roughly south-easterly direction past the Clyde Valley towns of Bothwell, Hamilton and Motherwell before meeting the cross-country A71 at Larkhall. It passes west of Lanark and beyond Abington, where it changes into the A74(M) and then goes to Moffat and Lockerbie, before making an end-on connection with the M6, near Longtown. From Junction 4 southwards it is part of the E05 Euroroute from Greenock to Algeciras. North from Junction 4, the E05 takes a short stretch of the M73 connecting to the M8 and then proceeds westwards through Glasgow to Greenock. The A74 was the original route from Glasgow to Carlisle where it met the A7 road which meets in Carlisle city centre the A6 south to London. Starting in the 1930s, the single-carriageway road between Gretna and Glasgow was progressively upgraded to dual carriageway, being completed in the early 1970s with the completion of the Gretna bypass. At the northern end, it was not possible simply to add to the existing carriageway because of the built-up nature of the area. 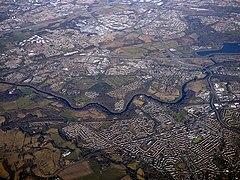 A bypass was built as one of Scotland's first motorways, the M74, from Draffan to Maryville, north of Uddingston, completed by 1969. Junctions were originally numbered from south to north, which was the normal convention at the time numbers increasing going away from London, as there were no plans to extend the motorway. The northern section around Hamilton was built as three-lane dual carriageway, narrowing to two-lane dual carriageway south of junction 4. It continued as the A74 Dual-Carriageway from Draffan and carrying on to link with the M6 junction 44 at Carlisle. The southern sections, where there was no need to bypass the existing route, were not originally upgraded to motorway standard, but to dual carriageway without hard shoulders or full grade separation. The gradual construction of the M6 from Rugby (where it met the M1 to London) to Carlisle in 1970, where it terminated on the A74, meant that the route from Glasgow to London was entirely dual carriageway. This led to calls for the already dualled A74 from Draffan to the M6 to be upgraded a second time, to motorway standard. As the government had already invested in the dual carriageway upgrade, they initially resisted these calls. In 1972 the Government agreed to extend the M74 from Draffan to today's J12 at Millbank. It was built in three sections, opening 1986–87. It was constructed to dual two-lane standard, and included a bypass of Lesmahagow, as the M74. In 1984, in preparation for the southwards extension,the junction numbers were changed to go from north to south, Raith (junction 5) on the original south to north numbering remained as junction 5, with Maryville (the most northerly junction at that time) becoming junction 4, leaving lesser numbers available for junctions for the expected continuation of the motorway northwards. When the first southern extension opened, Draffan, originally junction 1, ceased to exist and junction 9 (the first junction on the new extension) was and still is only a southbound exit onto the old A74 just south of Blackwood village, to serve the villages of Blackwood, Kirkmuirhill, Lesmahagow and Coalburn. In 1987, the government committed to upgrading the remaining A74 from J12 to the M6 to motorway standard. When the first section opened, as far south as Abington (J12-J13) in 1991 it was numbered M74. Following this, the government announced that the route would be completed as the M6, as the two motorways would meet head on at Carlisle. The Scottish section of the A74 was then upgraded in sections, not all contiguous, as the A74(M), a temporary number until all the sections were complete, and the eight-mile English section had been constructed and connected to the M6. They were constructed with dual three-lane carriageways. 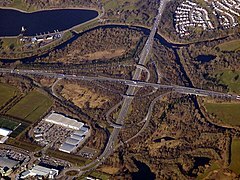 In 1995 the first northern extension was opened to Fullerton Road in Glasgow, as M74. The A74 upgrades were complete by 1999. Plans to upgrade the English section of A74 (Cumberland Gap) from the Scottish border at Gretna to Carlisle  were announced in 2004. Costing £174m, this was constructed as M6 as originally planned in the 1990s, and was opened on 5 December 2008. The project also included the construction of a new bridge crossing the River Esk. This means that there is now a continuous motorway from London to Glasgow, with four numbers (M1, M6, A74(M) and M74). Construction on the six-lane M74 Northern Extension (M74 Completion) northwards by 5 miles (8.0 km) through the south-eastern part of Glasgow to meet the M8 started in 2008, with opening on 28 June 2011. The extension involved the demolition of the Rosebery Park football ground. The city centre section is supposed to perform a similar role to the never-built southern flank of the Glasgow Inner Ring Road planned in the 1960s, and first set out as a scheme in the Bruce Report of the 1940s, but only half-completed. The scheme was at the centre of a road protest from local campaigners and environmentalists; their appeal against the road orders collapsed in June 2006. Alex Salmond officially launched construction on 28 May 2008. Archaeological mitigation was required as part of the project and was one of the largest coordinated series of excavations carried out in an industrial city in Western Europe. Due to the sheer size of the project a joint venture by Headland Archaeology and Pre-Construct Archaeology were responsible for the excavations in 2007 and 2008; during this time eight large former industrial sites were investigated involving more than a hundred archaeologists. Discoveries included the Govan Iron Works and associated workers' housing, the Caledonian Pottery, a block of 19th century tenements, a biscuit factory, urban limeworks and more. Many of the structures were in use into the 20th century. The excavation of both manufacturing and domestic sites provided a unique insight into both how objects were made and how they were used. Finds included stamped bricks from three local manufacturers, bottle and window glass fragments, and pottery stamps or transfer prints with different customer names on them. The motorway construction, initially expected to cost £445 million, ran under-budget at £437 million. The project total is estimated to be £692 million once the cost of purchasing land is included. There was a £12 million allowance for grouting of old mine workings. Road sign on the A702 showing the change in designation. Construction of the East End Regeneration Route which will connect the M74 Northern Extensions with the M8 motorway at the Provan Gas Works interchange with the M80 motorway. The Phase 1 and Phase 2 from M74 to Parkhead began in 2008 and completed in 2012, but Phase 3 from Parkhead to M80 will not be started until after 2014. It will make use of existing stretches of road and filler sections on currently derelict land. A new sculpture is planned near Gretna called the Star of Caledonia. One intention is for it to be viewed from the motorway, although there will be no motorway signs to indicate the structure. 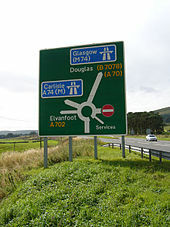 The motorway is usually referred to as the M74, but south of Abington it is the A74(M), as noted on each sign, save for one erroneous "M74" sign at Gretna Green services. As the motorway is one continuous route and has a continuous junction numbering system, its entirety is usually erroneously referred to as M74. Typically, upgraded A-road designations like A74(M) are retained for short bypasses of existing road, whereas the M74/A74(M) is one continuous intercity route. When the A74(M) was constructed in the 1990s, many of the signs were given patches with the A74(M) number: these patches can be peeled away to reveal "M6" underneath. One such sign, at the VOSA checkpoint at Beattock summit, states that it is the "M6 South", instead of the "A74 (M) South". This left an anomaly – the M74 began at Glasgow, then at J13 changed to A74(M) for the 40 miles to the border. Meanwhile, the English eight-mile section of A74 was not upgraded due to lack of funds, leaving the "Cumberland Gap" of dual carriageway between the three-lane motorways. Until around 1996, the change of designation to M6 once the Cumberland Gap had been closed was definite. When the Scottish Executive was established in 1999, taking over responsibility for roads in Scotland, Sarah Boyack said that "We have no current plans to rename or redesignate the M74 or A74(M) motorways between Glasgow and the border as the M6". When the original motorway sections were built in the 1960s, the motorway was numbered south-to-north, with Draffan at its southern terminus with the A74 Dual Carriageway being junction 1 and Maryville junction 6. When the M74 was to be extended south of Draffan in the 1980s, it was renumbered, in 1984 in preparation for the opening of the southern extension, north-to-south. The Raith or Raith remained as J5, while Maryville became J4, allowing for later extension Northwards, towards Glasgow. The original junction 1 at Draffan was closed, with the first new junction 9 (Blackwood) replacing it, using the southbound carriageway of the old A74 as a slip road. The remains of the semicircular access road to the southbound carriageway are still visible at Draffan Road, with the Blackwood slip road now used as an access road to new housing. In preparation for the extension to meet the M8 south of the Kingston Bridge,in 2010, junctions 1–3 of the First Northern Extension, were renumbered 2A, 3 and 3A to accommodate the new junctions. ^ "M6 Carlisle to Guards Mill Extension". Highways Agency. Archived from the original on 13 March 2008. Retrieved 20 January 2008. ^ "M6 North Extension, United Kingdom". Road Traffic Technology. Archived from the original on 4 February 2008. Retrieved 20 January 2008. ^ "Traveller Solution Gets M6 Guardsmill Project Off Track and on Road to Delivery". RMD Kwikform. 11 July 2011. Archived from the original on 21 September 2010. Retrieved 9 April 2011. ^ "M74 will benefit Scottish Economy". Transport Scotland. 28 June 2011. Archived from the original on 6 June 2013. Retrieved 5 April 2013. ^ Marshall, Chris (21 October 2008). "M74 Glasgow - Carmyle". Archived from the original on 18 December 2008. Retrieved 13 March 2013. ^ Nevell, Michael (2016). The Birth of Industrial Glasgow; The Archaeology of the M74. Society of Antiquaries of Scotland. ISBN 978 1 90833 210 3. ^ "M74 Completion — The Project". Transport Scotland. Archived from the original on 18 December 2009. Retrieved 30 December 2009. ^ "East End Regeneration Route". Glasgow City Council. Archived from the original on 10 October 2007. Retrieved 21 January 2008. ^ "Star of Caledonia: Scotland-England landmark plan approved". BBC News. 27 February 2013. Retrieved 27 February 2013. ^ "M74–M6". Hansard. 22 January 1997. Retrieved 6 January 2015. Lord James Douglas-Hamilton: The A74, A74(M), M74 route will be renamed the M6 on completion of its upgrading to full motorway status. ^ "Scottish Parliament Written Answers". Scottish Parliament. 13 July 1999. Archived from the original on 25 October 2004. Retrieved 1 December 2007. Sarah Boyack: We have no current plans to rename or redesignate the M74 or A74(M) motorways between Glasgow and the border as the M6. Wikimedia Commons has media related to M74 motorway. This page was last edited on 24 February 2019, at 13:59 (UTC).